LG 21 L Convection Microwave Oven (MC2146BV, Black) comes with impressive features that facilitate ease of cooking without any doubts. It has 151 auto cook menus, quartz heater and one year of warranty on product. 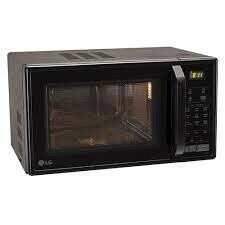 This 21 liters LG convection microwave oven is uncluttered and amazing in terms of delivering the performance. This microwave oven packs all the features that you require for easy cooking at home. It lets you cook everything by just pressing one button. You can easily roast, bake, brown, pasteurize and barbeque very easily. It comes with Diet Fry feature that requires very less oil to prepare a wide range of Indian snacks. You are going to enjoy all those Indian crispy snacks without worrying of all that oil playing havoc with your health. It lets you prepare dishes with very less oil. Further, it comes with Indian Roti Basket feature letting you prepare twelve different exotic Indian rotis by just pressing a button. You can easily prepare delicious naans, lachcha paranthas, tandoori rotis, thepla, missi rotis and appams very easily. Also, LG 21 L Convection Microwave Oven (MC2146BV, Black) comes with motorized rotisserie that performs 360° rotation for even cooking. With the help of this motorized rotisserie barbequing related stuffs become very easy in the comfort of your own kitchen. Since it doesn’t require manual intervention so it becomes really very easy to prepare those cooking items. And there is no doubts to retaining the nutrition in the prepared food, it greatly preserves the nutrition in food to give you healthy food all the times. Other highlights are auto-cook menus, milk pasteurization, stainless steel cavity, Intellowave technology, multi-cook tawa, charcoal lighting heater, microwave oven recipe book and a quartz heater.